THIS IS YOUR GOLDEN OPPORTUNITY TO OWN A GENUINE ERTE ART DECO CREATION! From an original design by the ¿Father of Art Deco¿, Erte¿s famous ¿Alphabet¿ series was first a Suite of Serigraphs and then a priceless collection of figures cast in precious metals set with gemstones. 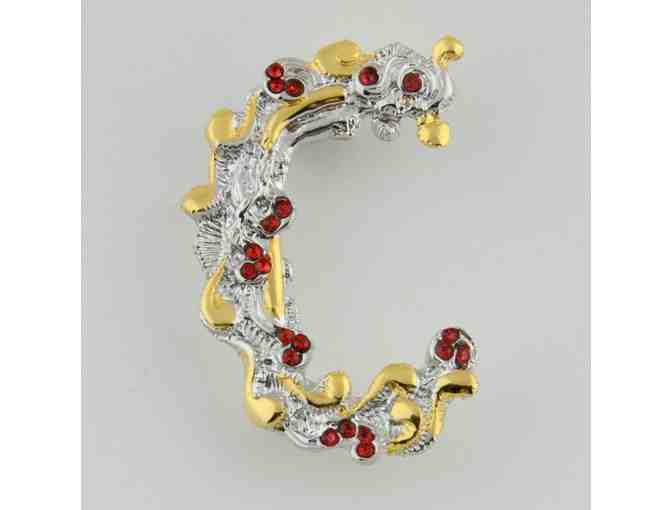 We are pleased to present this sparkling Pendant/Brooch depicting the letter ¿D¿, made of solid gold-plated Sterling Silver and hand-set Swarovski crystals, cast from the same mold used to create the original! 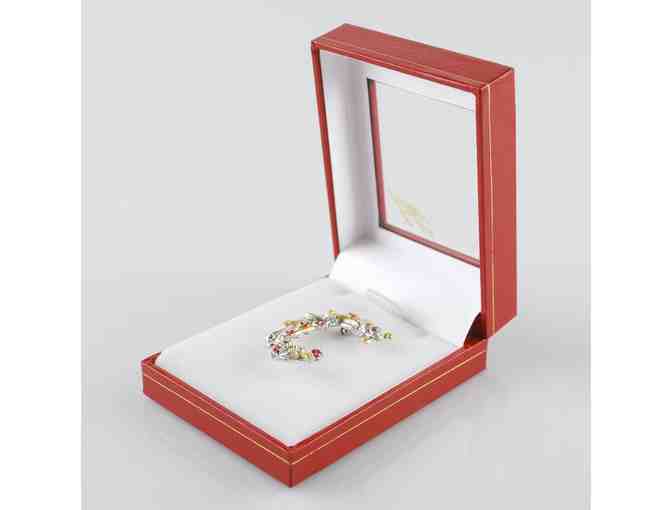 This piece comes in a simple and pretty gift box with the Erte stamp on it. Officially Licensed by the Estate of ERTE, bearing the official stamp of his signature! Measures approx. 1.5" x 1", 3.6 grams (weight). Erte disappeared somewhat from the fashion scene in the years following World War Two, only to have his glamorous career re-launched in 1967 by London art dealer Eric Estorick, who was greatly impressed by Erte¿s vast body of work. Effectively taking New York and London by storm, the duo also introduced a new generation of fashionistas to Erte¿s spectacular Art Deco creations. With demand for his work at an all time high, Erte found that while the wealthy happily paid top dollar for his original pieces, young people of limited means were clamoring for something they too could afford. This led to a decision to create multiples, first of graphics, and later, of bronzed sculptures. During the quarter century of Erte's "second career," he achieved a level of fame which rivaled the first, if only for its wider reaching expanses. PLEASE TAKE A FEW MOMENTS TO VISIT OUR AUCTION HOME PAGE! Click here to see hundreds and hundreds of awesome offerings ON AUCTION NOW! NOTE!! The "GOOD NEWS": ALL OF THE ABOVE COSTS ARE INCLUDED IN THE RESERVE "BUY NOW PRICE". Your support matters, so ART+more4Good would like to use your information to keep in touch about things that may matter to you. If you choose to hear from ART+more4Good, we may contact you in the future about our ongoing efforts.